But will their speed actually help them win? K.C.’s Whit Merrifield led the league in stolen bases last season. With a blazing average of 4.07 seconds to first base — that’s 15.1 miles per hour — Kansas City Royals shortstop Adalberto Mondesi was one of the fastest players in Major League Baseball last season. But this year, he’s not even the fastest player on his own team. That honor belongs to new center fielder Billy Hamilton, who runs to first in an astonishing 3.94 seconds. Fourth outfielder Terrance Gore might not be much slower, either, and none of those guys is even the reigning MLB leader in stolen bases — which K.C. right fielder Whit Merrifield happens to be. These are the 2019 Royals: The fastest baseball team assembled in years. It was clear from the start that this team’s identity would be all about running as fast as possible: “We want to be a motion team,” general manager Dayton Moore told MLB.com in February. “We have to be elite at some aspects of the game, and defense and speed is something we can be elite at.” And Kansas City has already put that speed to good use in its season-opening games against the Chicago White Sox, with Merrifield and Chris Owings swiping three combined bases and Mondesi hitting two triples in a 2-1 series victory. If the 2014 and 2015 Royals were an experiment in whether a talented small-ball team could win a championship in the modern game (it worked), this year’s version will be more about how much pure speed can make up for a lack of talent in other areas. The Royals might not be “good” per se — but in an era when just about every team is constructed according to the blueprint of advanced analytics, they will be different, and that might have value in itself. Certainly last season’s Royals could not have been described as anything other than abysmal. K.C. went 58-104, the team’s worst record in 13 years, and had only five regulars1 in common with the 2015 championship club: Alex Gordon, Salvador Perez, Alcides Escobar, Danny Duffy and Mike Moustakas. (Moustakas was then traded to Milwaukee in July; Escobar signed with the White Sox over the offseason.) The Royals were sixth-to-last in scoring and fourth-worst in runs allowed, with a defense tied as the fourth-least efficient in baseball. This was far removed from the team that celebrated the franchise’s second world title just three years earlier. This year’s team is projected to be better yet still far from first place. The preseason FiveThirtyEight forecast called for Kansas City to improve all the way to 70 wins, though most of that change could be attributed to regression toward the mean rather than any specific additions. (In fact, K.C.’s most notable roster development since last fall was the news that Perez, a six-time All-Star, would miss the whole 2019 season with an elbow injury.) The projections were also low on both the 2014 and 2015 Royals, getting blindsided entirely by their World Series runs, but at least those teams had established, scout-approved talent with some sort of a track record and upside. The 2019 Royals don’t pass the eye test any more than they impress the computers. The projected speed in this lineup, however, is the genuine article. According to FanGraphs’ preseason depth chart projections, Royal hitters were forecast to swipe 168 bases this year, which represented 6.2 percent of the total steals predicted for all of MLB.2 If Kansas City hits that benchmark, it would become only the sixth team since 1996 to claim at least 6.2 percent of leaguewide stolen bases. The 2016 Brewers did it recently, but mostly that rate was a hallmark of teams from the 1960s, ’70s and ’80s, when gaudy steal totals were the norm and not every team had settled into similar offensive philosophies guided by sabermetrics. The speed of these Royals emerges in other metrics as well. I filtered down every opening day lineup since 1950 for those that contained at least eight players who had logged 200 or more plate appearances during the previous year. Then, for each lineup, I averaged two numbers from its players in the season before: Speed Score — a Bill James invention that estimates raw speed by combining stolen bases (both attempts and successes), triples and runs scored as a percentage of times on base — and FanGraphs’ Base Running (BsR) statistic, which quantifies the run value of every base-running action (including steals and advancement on other events). 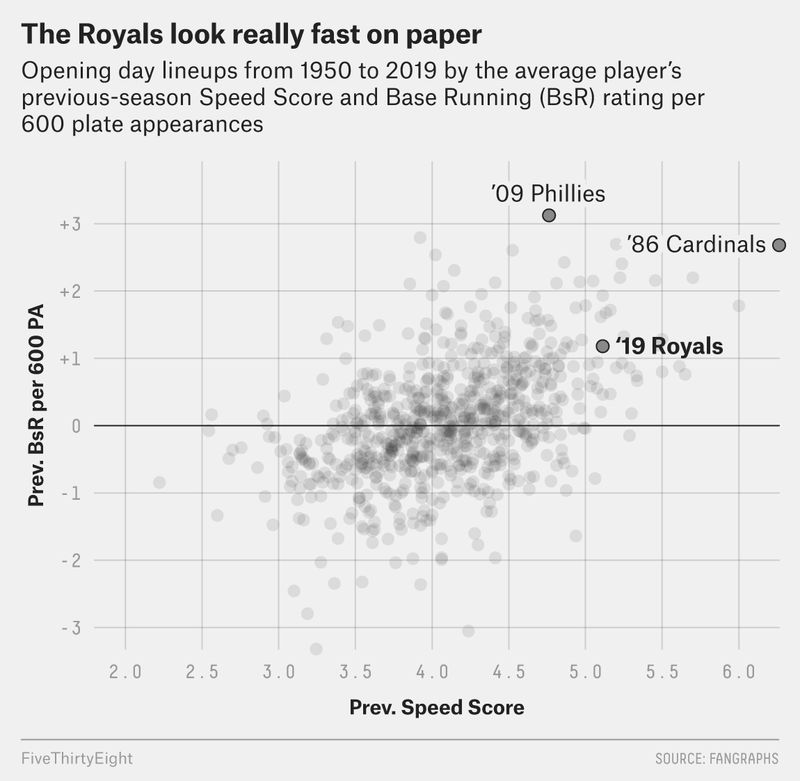 The 2019 Royals’ average Speed Score is tied for 24th since 1950, and its average BsR per 600 plate appearances ranks 71st; only 12 opening day lineups were faster by both measures, and half of those played during the nine-season span from 1978 to 1986, a heyday for running teams. The Royals’ next step, though, is turning all that speed into more tangible results. Perhaps most surprising in Kansas City’s portfolio of badness last year is that the team was somehow MLB’s fifth-worst at base running (according to BsR) despite the steals-leading presence of Merrifield atop the lineup for most of the year. The Royals’ speed was above average — if not quite as impressive as this season — but they didn’t use it well, particularly between bases in advancement scenarios. According to FanGraphs, K.C. lost 12 runs (more than an entire win) relative to the average team in base-running situations that didn’t involve steals. One of the ways K.C. can improve this year is to deploy its running game in a smarter way, using it to take advantage when opponents inevitably offer up chances to take extra bases. That’s an area in which Kansas City might take a cue from its 2014-15 teams, which were legendary for their opportunism on the base paths. Take the famous ninth-inning play that extended Game 5 of the 2015 World Series: Eric Hosmer’s heads-up sprint from third base to home on a weak groundout, a daring piece of aggressive base running that forced an errant throw by Mets first baseman Lucas Duda and tied the ballgame. The Royals would eventually score five 12th-inning runs off New York’s beleaguered bullpen to secure the championship. Hosmer (career Speed Score: 4.0) wasn’t even fast, so imagine how much more damage Hamilton, Mondesi, Merrifield and friends could do if they pick their base-running spots correctly. Along the same lines, Kansas City is also hoping this speedy roster can emulate the 2015 Royals’ defense, which according to FanGraphs was the best in baseball in terms of runs saved relative to average. Larger issues, such as the team’s dismal .305 on-base percentage last season, might place hard limits on how much value Kansas City can get out of its speed this year. (Even Sunday, the team was being no-hit by Chicago’s Lucas Giolito — owner of a career 5.48 earned run average going into the game — into the seventh inning.) But no matter what, it should at least be more worthwhile to watch the fleet Royals this season, both for the entertainment of all those steals and as an experiment in against-the-grain team-building. Meaning they logged at least 2 percent of available team playing time between plate appearances and (leverage-weighted) innings pitched. Including players who were free agents in spring training but were still predicted to sign somewhere and accumulate some steals by season’s end. Who, incidentally, faced the Royals in the 1985 World Series (and lost).